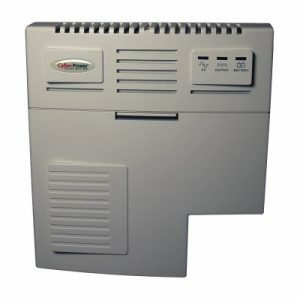 Designed for interior use, the CyberPower CS75A12V3 Indoor CyberShield™ FTTx System supplies continuous 12 VDC to local power network interface devices (NID), cable telephone modems, wireless base stations, fiber to the home (FTTH), optical network terminals (ONT), and integrated access devices. Features of the CS75A12V3 include high-function design, cold start functionality, audible alarm signals with silence options, microprocessor intelligent control, a telemetry interface, optional extendable runtime, user-replaceable batteries, and LED indicators. It also comes with a three-year warranty. Indoor Design – Provides durable casing to protect the model and keyhole slots for wall-mounting in locations such as garages, basements, and utility closets. Cold Start Functionality – Restores emergency power to the load after the installation of new batteries. Telemetry Interface – Provides alarm conditions to the ONT: On Battery, Replace Battery, Battery Missing, Low Battery. Audible Alarms – Signal conditions that may affect operation: On Battery and Low Battery. Alarm Silence Button – Selectable Enabled / Disabled. LED Status Indicators – Provide information about the control and operation of the model related to AC, output, and battery. User Replaceable Batteries – Can be changed by a technician when needed without replacing the entire model. Three-Year Warranty – Covers defects in materials and workmanship in the product under normal use and conditions within three years of the purchase date. call 800-876-9373, or email sales@power-solutions.com.